Protests are continuing in Algeria against another term for ailing leader Abdelaziz Bouteflika — and despite reports he’s promised not to serve his full time if reelected in April. Demonstrations mobilized tens of thousands across Algeria — as well as Algeria’s diaspora in former colonial power France. Roughly 6,000 people crammed the Place de la Republique in downtown Paris on Sunday, chanting and brandishing signs like ‘basta!’ — or enough — and ‘president not found’ — in reference to 82-year-old President Abdelaziz Bouteflika, who is confined to a wheelchair and rarely seen in public. Algerian Houda Omerani said Bouteflika has served his time. Five terms is too much. It’s time for change. Her friend Yasmine Bouaouiche said Algerians aren’t just protesting another presidential run. The whole power system has to change. But people don’t want to return to the bloodshed and violence of 1991. 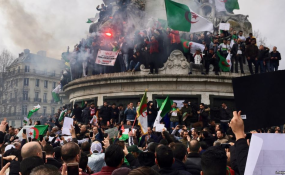 The popular protests in Algeria, some of the biggest in decades, have taken both the government and experts by surprise. And they have been largely peaceful. Nobody wants a repeat of the 1990s civil war that began with a 1991 legislative election in which an Islamist party won. There’s another difference. Like other recent uprisings, this one is largely driven by social media. “All the calls for the protests were on social media. And also social media played a main role to keep it peaceful, because people are spreading this message and enforcing (it)," said Algerian blogger Kamel Labid. Labid traveled from London to join the Paris demonstrations. Like others, he agrees there are few existing alternatives to Algeria’s current government. The political opposition is aging and weak. “But Algeria has 40 million people. So we can get younger people, people who can lead the country,” he said. That may include some among Algeria’s sizable diaspora in France, estimated at between one and two-million people. French Algerian Madjid Messaoudene is a municipal councilor in the Paris suburb of Saint Denis. Messaoudene said he’s proud to be both French and Algerian. It gives him hope to see the massive mobilization in his parents’ homeland — with a single objective, he says: to topple the system.